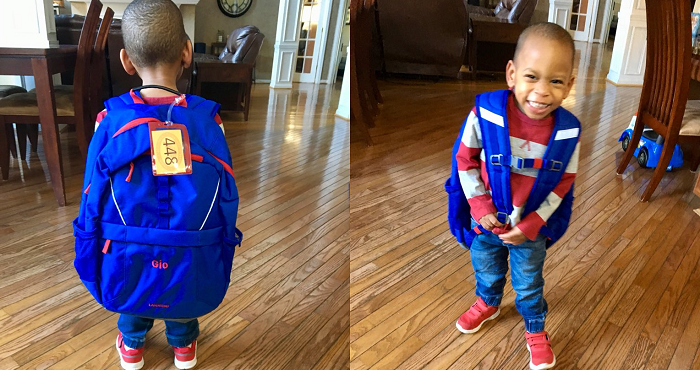 An adorable little kid was ready for his first day of preschool. He had a new haircut, a nice outfit, good shoes, and the most important item of all: a backpack. It was HUGE. Well, for a small child, it was huge. For a grown adult, it would have been the perfect size, but seeing a small boy nearly engulfed in a massive backpack was too adorable to pass up. The picture was seen by millions of people, and they were in love with his enthusiasm. He was SO ready for school! Sure, he could have gotten a child-sized backpack. Sure, he probably could have gotten away with only bringing a lunchbox…but this was a hundred times more fun! People flocked to the adorable kid and wished him a happy first day of preschool! Some were concerned that a heavy backpack might hurt his spine, but she assured everyone that it wasn’t much aside from a few items. Plus…look how excited he was to wear a “grown up” backpack!